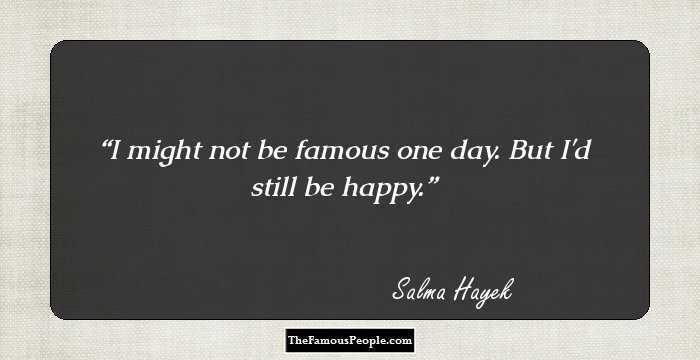 A collection of motivational quotes and sayings by Salma Hayek on love, fun, beauty, life, hope, happiness etc. Salma Hayek says that she does not have stamina in exercise; but has it in life. A naturalized US citizen, she is very proud of her Mexican heritage and talks extensively about her background and culture. Chatting about her first years in the US, she says, “I didn't speak English, I didn't have a green card, I didn't know I had to have an agent, I couldn't drive...” Yet, she made it through sheer determination. 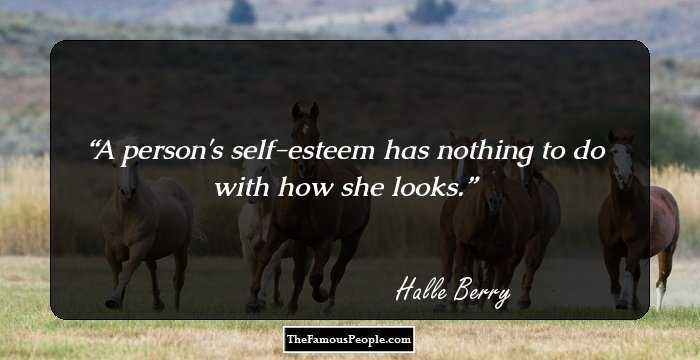 In interviews, she has talked about her life and work, about her daughter and her farm, about her ideas on beauty. A well-known woman activist, she has also talked about violence against women and other relevant topics. Here are some of her motivational quotes on love, fun, beauty, life, hope, happiness etc. When I speak about freedom, it's about freedom of the spirit. 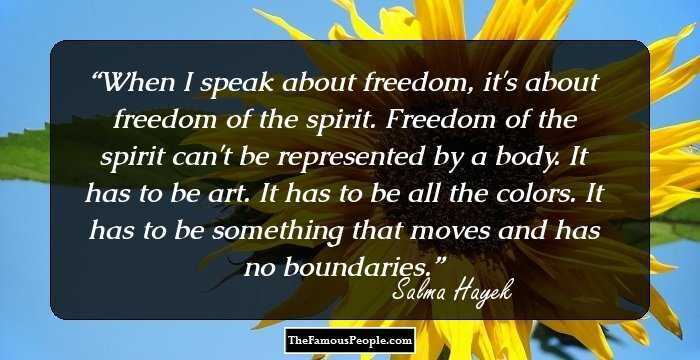 Freedom of the spirit can't be represented by a body. It has to be art. It has to be all the colors. It has to be something that moves and has no boundaries. 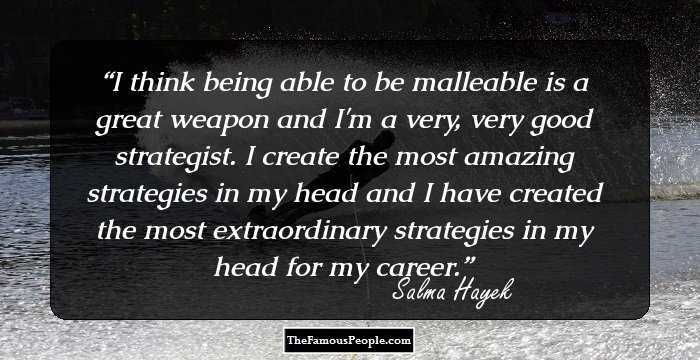 I think being able to be malleable is a great weapon and I'm a very, very good strategist. I create the most amazing strategies in my head and I have created the most extraordinary strategies in my head for my career. 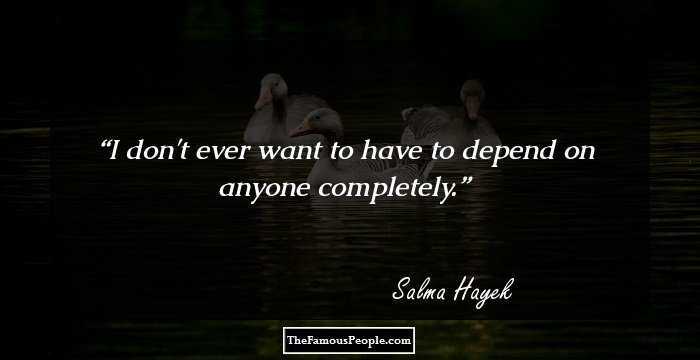 I don't ever want to have to depend on anyone completely. I might not be famous one day. But I'd still be happy. Life, I've got lots of friends. I don't complain. It breaks my heart because there are some parts I know I would have the right spirit for, and I just don't get them because I have an accent. Botox, trust me I've been tempted - but I resist! Think about what happens to your muscles - and your skin - if you're sick and don't move for a few days. If it wasn't because of my high heels, I would still be in Coatzacoalcos with 10 children. I can learn my lines fine. It’s just reading them in the first place that is the problem. Make yourself smell nice. I even wear perfume sometimes when I'm alone. I'm saving my sick days for when I'm feeling better. When I'm doing a movie, that's when I relax. As stressful as it can be, as much pressure as it should be, making movies is still the place where I feel the most at ease and I truly enjoy it. That's why I make so many. 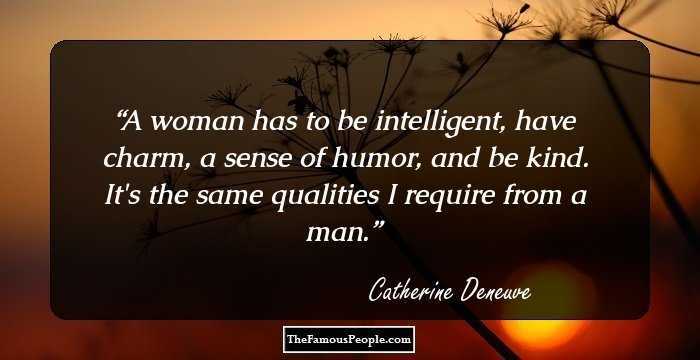 As a woman, you should be more at ease with your sexuality when you are in your 40s...You are more self-assured about that part. And that's the way it should be. 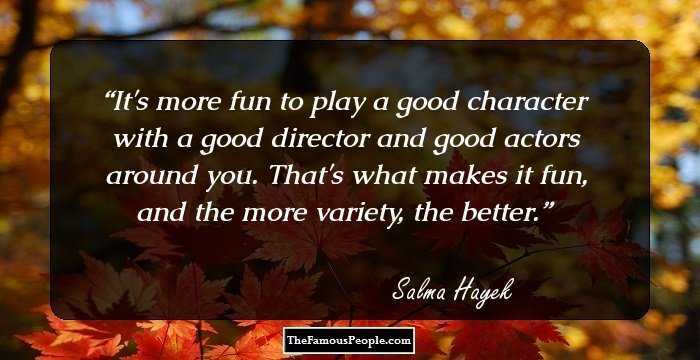 You want to do movies that your children can watch, and that your children can have fun at and enjoy the experience of shooting. What worries me the most is that most men are so weak. Because of that they act like they don't care and like machos - because they are too fragile inside. They're scared of confrontation and afraid of so many things. I think today that's a very big problem because of the world we live in and the social media and everything... everybody is obsessed with their own identity, but seen through other people. I think I'm very good at adjusting to anything and to any situation, and if you are good at being in the moment and adjusting, you can actually have a clear vision of what to do with things or how to do things. Do I envy Madonna’s body? Yes. Do I thank God that she has it? Yes! If you’re fifty-something and you look like Madonna, and you put a lifetime’s work in the way you look, then flash it to the world! It sounds trite to go after men who are nice but when you've been hurt a lot it becomes appealing. No surgical tweaks. 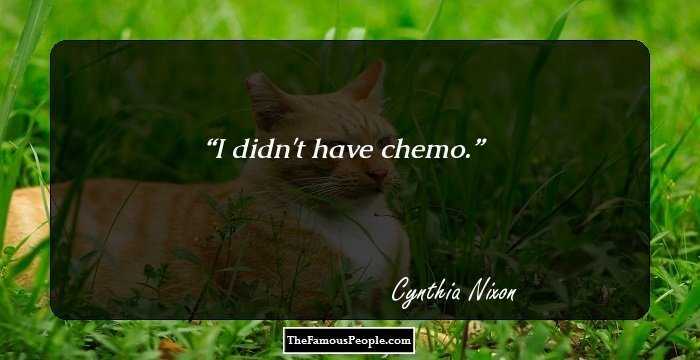 No Botox either. I think it is terrible, these girls in their late 20s injecting their faces and lips. One told me, If I kill my muscles now, I'll never get wrinkles. Can you imagine? I've never had anything done on my face. I've never had dermabrasion or peels or injections of any kind, nothing. I always look forward to seeing a man who has more brains than me. ...you have to understand that motherhood has to be your priority. It's important work. Life is about chasing after the things you think are truly worth it, even if they don't happen, I'd rather have nothing but know I didn't settle for something I didn't want! I don’t have stamina in exercise...but I have it in life. The thought of somebody pulling and cutting around my face gives me stomach ache. Plastic surgery would be so painful. What if it doesn't look good? What if they made a mistake? I couldn't do it. There were many times when I had to emotionally come to terms with the fact that maybe I wasn't ever going to get married. And I started getting comfortable with that. Being a mother is more exhausting than working, and sometimes I push myself too hard and burn myself out. I can appreciate how exhausting it must be for women who have to do everything themselves all the time. I like being a mother. For some people, it's so much work that it can be a burden. But it's not for me, maybe because I had my daughter, Valentina, later on in life, at 41. What once was an expression of who I was - acting - also became my hiding place. They thought I was crazy in Mexico when I said, 'I'm going to Hollywood.' Nobody thought I could make it. I grew up in Mexico, not the U.S., and the fact is that there just aren't any parts for Latin actresses. I have to persuade people that my accent won't be a problem, but an asset. I have always been an active part of my community. I have a ranch, which is my favorite place in the world. I love to cook for my husband and daughter. I enjoy going to the market for fresh vegetables.